Tommy John surgery, or reconstruction of the ulnar collateral ligament (UCL) in the elbow, has been dubbed an epidemic among Major League Baseball pitchers. A mechanical engineer at Washington University in St. Louis plans to develop a bioinspired imaging technique to study how damage accumulates in the UCL during loading, or the stress of activating the ligament. This could provide insight into what is progressively happening to these soft tissues when pitchers throw fastballs dozens of times during a game. Spencer Lake, associate professor of mechanical engineering & materials science in the School of Engineering & Applied Science, is leading the research with a three-year, $388,541 grant from the National Science Foundation. The study stems from an ongoing collaboration with Viktor Gruev, a former associate professor of computer science at WashU now at the University of Illinois at Urbana-Champaign, and Matthew V. Smith, MD, assistant professor of orthopedic surgery at the School of Medicine. This polarized light-based imaging technique aims to improve the microstructural and mechanical evaluation of soft tissues, particularly as mechanically-induced damage or biologically-induced degeneration accumulates in ligaments or tendons. Lake's research team uses a custom polarization camera designed by Gruev that mimics the vision of the mantis shrimp, which senses multispectral and polarization information to detect prey. Lake and Gruev appeared on a National Geographic Special in 2016 discussing the camera and its imaging technology. Building upon previous research that studied region-specific properties of the knee ligaments, the current project will shine light of a known polarization state off the surface of the UCL, then use the bioinspired camera to measure the properties of the reflected light. 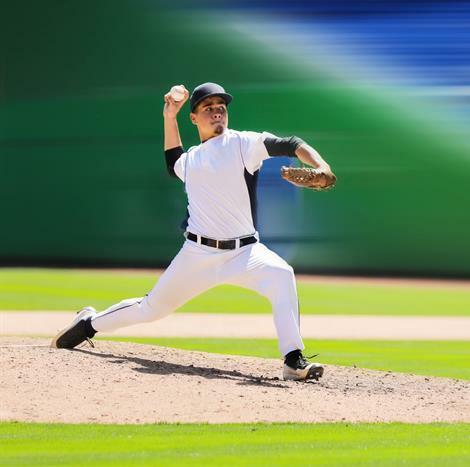 As the extreme aspects of the baseball pitching motion are thought to cause microdamage to the UCL, changes in light while the ligament goes through this motion can provide insight as to how the UCL is injured. "If we compare what we know about the light to begin with and measure its properties after reflecting off the tissue, we can determine how the ligament is organized and how it changes dynamically during loading," Lake said. Prior to this technique, similar types of measurements required removal and thinning of tissues to enable light to shine through the full tissue. To get physiologically relevant information about how mechanical damage affects soft tissue, the tendon or ligament of interest needs to remain as close as possible to its in vivo state. That's where this imaging technique is expected to be a big improvement over existing techniques, Lake said. The new approach will enable analysis of full-thickness tissues in more natural configurations. In addition to looking at how mechanical damage accumulates in the UCL, Lake and his team also plan to study how biological damage accumulates in the rotator cuff tendons. About 40 percent of adults 50 and over experience painful and debilitating rotator cuff injuries or tears in their lifetimes. Lake and his team will treat a rabbit rotator cuff tendon with enzymes to stimulate degeneration and break down the collagen matrix. They will then use the same polarization imaging technique to track these biological changes in real time. "These are two test cases to show that the technique is going to be effective at measuring the microstructural organization of soft tissues," Lake said. "In the future, we hope to use it for many kinds of different applications. The advantages are that we can leave the tissues intact and that we can measure the changes quickly." Eventually, Lake and his team would like to be able to use the technique during an arthroscopic surgery to immediately evaluate the integrity of patient's soft tissues. In addition, Lake and his team plan to work with local middle school students to teach them about polarized light and engage them in this project by enlisting their help to develop applications for how the technique could be used. The team plans to develop a free electronic book to showcase and disseminate the key concepts and developed ideas.